Train 42-44 is one of SRT's Sprinter, Diesel Railcar services. These are the fastest trains on this route and are made up of just a few 2nd class, seat only, air-conditioned carriages. Included in the ticket price is a meal and soft drinks served by the onboard steward / stewardess. As this and many other train services from Hua Hin to Bangkok depart in the early hours of the morning, you may want to find alternative transport. 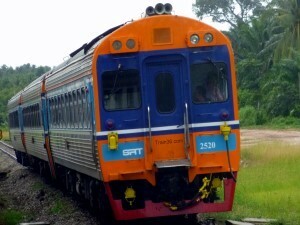 These fast trains to Bangkok from Hua Hin offer only 2nd class, reclining seats in one of usually only three air-conditioned carriages. Passengers are taken care of by an onboard steward or stewardess who serve complimentary soft drinks and meals. The air-conditioning can get quite cold (especially at night), so bring something warm to wear. 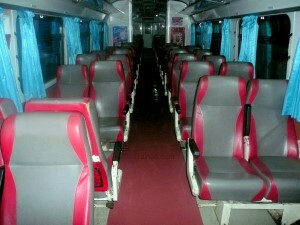 You will need to make a reservation to get a seat on one of these Sprinter trains to Bangkok from Hua Hin. You could get lucky and buy a ticket on the day of travel, but we would not recommend you go to the station without booking your seat first. Advance booking for this short trip is only available 30 days in advance (long distance tickets can be booked up to 90 days in advance).